The members of the county’s Industrial Development Authority might be forgiven for misunderstanding the line of command, given what Davis told them at their Oct. 13 meeting. Davis left Administrative Officer Benko and the other four commissioners out of his explanation of the procedures that the county would follow in replacing Rusty Haygood, who stepped down as economic development director the previous week to take a position with the Georgia Department of Community Affairs. Davis also did not mention Benko or the other four commissioners when he explained how the Economic Development Department would operate in Haygood’s absence. Davis put himself at the center of the hiring process and of the operation of the development department until a replacement for Haygood is found. “We’re in the process of reviewing the job description, and hopefully that will go out for publication, hopefully next week,” Davis said at the Oct. 13 meeting. If members of the IDA had any questions in the interim about the Economic Development Department and its operations, those questions should “come to me,” Davis said. Davis said he would work with Jay Boling, the economic development assistant, who is handling the work of the development office in Haygood’s absence, to make sure the IDA members’ needs were addressed. “What he can’t fill in, I’ll work with him on,” Davis said. On Aug. 4 of 2009, after months of deliberation, the BOC passed 4-0 an ordinance drafted by County Attorney Daniel Haygood changing the organizational chart for the county. Prior to that change, all department heads and the county administrative officer had reported to Davis. The ordinance passed in 2009 says that the county administrative officer and finance director, as well as county attorney and county clerk, report to all five members of the Board of Commissioners equally. All other department heads, including the economic development director, report to the administrative officer. Chairman Melvin Davis stated his opposition to the ordinance when the Board passed it and asked that his opposition to be recorded in the minutes. The chairman votes only in the case of a tie, so Davis had no other way to register his opposition. The four voting commissioners had pushed for the change in the organizational structure as a way of guaranteeing that they could get information on issues directly from department heads or through the administrative officer. Under the old system, Davis controlled the flow of information to the commissioners, and they contended that they often were not given sufficient, timely information to inform their votes. The ordinance adopted in 2009 also states that department heads can be hired only with the approval of the Board, upon the recommendation of the chairman, the administrative officer and the human resources director. Prior to the change, the chairman hired and fired department heads. Davis’ assertiveness on the hiring of the replacement for Haygood reflects the increased power he has gained in the last two elections. Commissioner Chuck Horton had been a leader in bringing about the changes in 2009. He was defeated in 2012 in his attempt to unseat Davis as chairman. Mark Saxon replaced Horton, and Saxon has generally sided with Davis in the last two years. Bubber Wilkes defeated Margaret Hale in the May Republican primary and was elected on Tuesday night without opposition. He will take his seat on the Board in January. Hale had been another strong voice for an independent BOC and for the changes approved in 2009. Wilkes said during the campaign he wanted to give the power back to Davis that had been taken away through the changes in 2009. With the votes of Saxon and Wilkes, Davis could pass an ordinance undoing those changes. 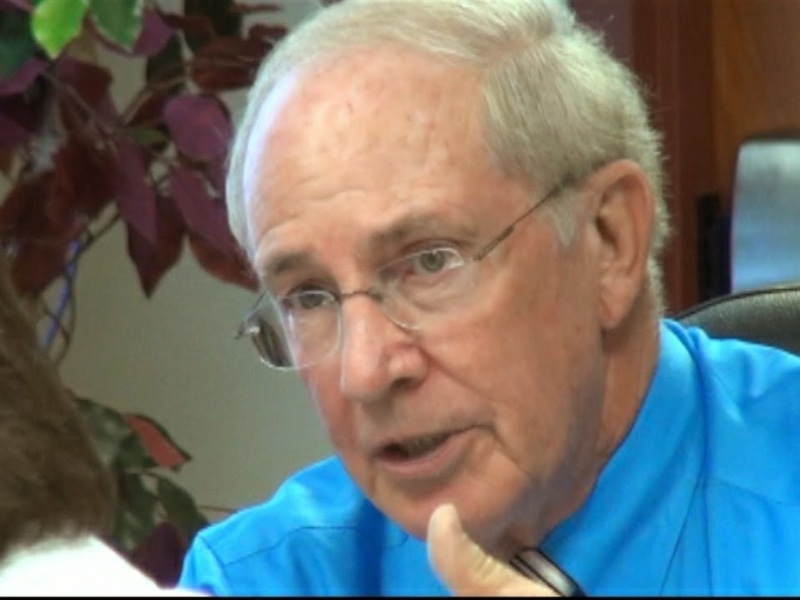 The full video of Davis’ comments on replacing Rusty Haygood and on the operation of the Economic Development Department in the interim is below. I did not anticipate that Davis would go into such detail and failed to focus the camera on him while he was speaking. I have increased the volume of Davis’ comments to make it clearer what he was saying. In the video, from left to right, are the following IDA members: Chairman Rick Waller, IDA Secretary Angela Helwig, Ed Perkins, Watkinsville Mayor Charles Ivie (back to camera), Matt Elder, Chamber of Commerce President Kay Keller, Mark Thomas, Rep. Chuck Williams of the Georgia House (back to camera) and Davis. The video lasts 2 minutes and 30 seconds. Sounds like Oconee has its own "Jerry Jones" running things. Time for the other commissioners to stand up and realize that working together collectively is better than following blindly. This is a true test on whether the other four commissioners will step up and lead and trult represent the public, of it they will bow down and acquiesce to King Melvin and Price Rick Waller.